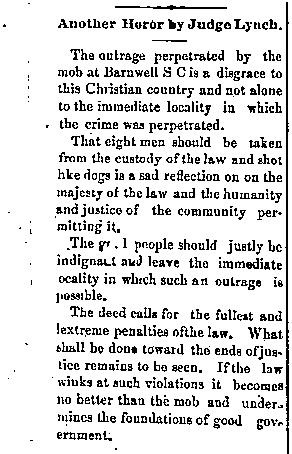 On December 28th, 1889, whites removed eight men from jail in Barnwell, SC, where they were awaiting trial for various offenses, and lynched them at the courthouse. Sometimes referred to as a “mass lynching,” and other times referred to as a “massacre,” the men killed included Ripley Johnson, Ralph Morral, Hugh Furz, Robert Phoenix, Mitchell Adams, Peter Bell, Harrison Johnson, and Judge Jones. This mass lynching was controversial, even for those who supported lynching. 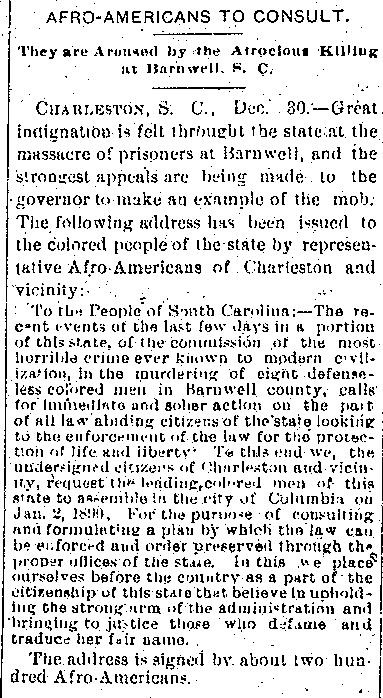 The Augusta Chronicle (below), for example, defended lynching in some cases, but called on the governor to prosecute the men who perpetrated this lynching. In particular, many were aggrieved over the case of Ripley Johnson, who newspapers said had a strong case of self-defense and might have been acquitted in a jury trial. The incident does not appear on the NAACP’s list of lynching prosecutions. Very brief mention, 15th news item, about a third of the way down the column. Also makes mention of violent disturbances in Georgia and Tennessee.